The practice of shaving is often, if not almost automatically, associated with the use of products that either facilitate or complement it, or take into account specific and particular problems. In this contribution, devoted to liquids, powders, soaps and shaving creams, we will gradually see the different types of products used in these practices. The use of products facilitating shaving is not recorded in prehistoric times, although razors have been found in Neolithic bronzes, in Europe or among the Eskimos. It is known that the Egyptians already manufactured products similar to soap: a medical document dated 1500 BC, Papyrus Ebers, describes the association of vegetable oils and alkaline salts to form a material close to soap intended for hygiene and care of skin diseases. A shaving product is a product that should allow an easy, gentle shave, without pain or cuts, limit irritation, prevent the appearance of pimples related to hair growth under the skin. The history and technical evolution of shaving products are inseparable from the evolution of shaving tools and practices. Much later, aftershave products will complete the entire offer in this area. The first uses of products mention water as an element facilitating shaving, but very quickly, the addition of soap takes place in current practices. The soap allows to"wet" the hair more effectively and brings a lubricating effect to cut them without hurting the skin. These"wetting" (softening) and"lubricating" effects are the essential points of these product categories. Once the hair and skin are wet, with warm water to dilate the pores, a shaving product is applied which, on the one hand, maintains a good hydration of the hair and, on the other hand, protects the skin from the aggression of the blade. Shaving products have a well-defined role in the shaving operation. This role is due to four main actions: - detergent: the product removes dirt and oil or sebum naturally present on the surface of the skin, the cutting action is facilitated..; - mechanical: the developed foam tends to maintain the hair in the straightened position, otherwise, it would remain lying on the skin and the razor would slide on it ; - emollient and lubricating: the products contain active substances that soften the hair and make it less resistant ; - protective: the products contain treating substances that form a protective film that prevents the razor from scraping the superficial layer of the epidermis (stratum corneum) too much. The basic rule of shaving is"hydration". Indeed, wet hair is softer (like hair after a bath). This tenderness makes shaving easier, requiring fewer blade passes and, as a result, less irritation. The first shaving product used by prehistoric man is certainly water. The hair softens on prolonged contact. The submerged hair eventually loses its sebum envelope, allowing water to penetrate its structure to soften it. This change in physical properties makes it softer and easier to cut. Water is still the essential preparation product for shaving today. But if it changes the nature of the hair to cut, it brings however little lubrication of the skin under the blade. If it is the easiest product to use, it is not the most common. Ancient Rome improved the technique by following the wetting of the hair with an application of olive oil. Acting like a cutting oil, it provides the necessary lubrication for the blade to slide on the skin. It reduces friction between the blade and the skin, allowing it to remain more taut and have less roughness that can be cut. Olive oil also provides beneficial hydration to the epidermis. However, this improvement has a major drawback: the greasy nature of the oil makes rinsing with water very difficult, and the after-shave sensation is quite uncomfortable. This practice is gradually being abandoned, even though some shaving oils are still marketed. The return to more natural and apparently less technical products has allowed the contemporary development of shaving oils operating on the same principle as ancient oil. Shaving oils offer improved lubrication compared to the vegetable oil used in antiquity, but their composition can make rinsing the skin difficult. It can also happen that the thick material formed by mixing oil and cut hairs more easily clogs the space between the blades, making shaving more difficult. CAPRYLIC/CAPRIC TRIGLYCERIDE, GLYCERIN, OLEA EUROPAEA (OLIVE) FRUIT OIL, AQUA (WATER), SUCROSE LAURATE, SUCROSE STEARATE, PERFUME (FRAGRANCE), VACCINIUM VITIS-IDAEA FRUIT EXTRACT, RUBUS CHAMAEMORUS FRUIT EXTRACT, RUBUS ARCTICUS FRUIT EXTRACT, CITRIC ACID, LIMONENE. They had a period of use, mainly at the beginning of the 20th century. They are intended to facilitate the sliding of the razor on the skin. Composed essentially of talc or mineral powders with very low friction coefficients, or soaps in powder form added with detergents, they are more traditional than real use. Dedicated mainly to wet shaving, they can also be used with electric razors in the case of talc-based powders. 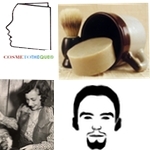 The discovery of soap and its ability to foam when mixed with water is an important step in the history of shaving products. Worked with a brush, the brush raises the foam, which the soap makes thick and durable. The effect is twofold. - The lipophilic and surface-active action of soap helps to rid the hair of the sebum that surrounds it and makes it permeable to water, which improves its hydrophilicity. The hair is better hydrated. - Water can penetrate the hair and soften it to make it easier to cut. The hair must be kept in contact with the foam for a few minutes to really facilitate shaving. Besides, soap foam provides relative lubrication to the blade. Beard soap has been declined in different forms from this formulation concept. The differences mainly concerned the quantity of soap present in the preparation, which is directly involved in shaving aid. In other words, soaps are more effective in shaving aid than shaving foam. But, in any case, the performance level of these different products is satisfactory and allows easy shaving. The table below compares the formulation differences between these different products. Beard soap itself is mainly presented as a block (as a stick or sometimes in a bowl), or as a paste (in a tube similar to toothpaste) and, in rarer cases, as a powder. It appeared industrially from 1830. It consists of a high concentration of soap. Soda soaps are preferred to give consistency to the block and allow their manufacture, either by casting and striking, or by direct formation of sticks. A real alternative to beard soap, this type of product has also been a great success. There are two different varieties: with and without badger. In both cases, they are generally emulsions with a continuous aqueous phase, containing a fairly large quantity of soap. As with beard soap, it is a matter of wetting and impregnating the hair properly to facilitate cutting and shaving. The soaps used in these preparations are generally common alkali stearates, soda or potash, but potash soaps are preferred to obtain softer and softer textures. The soap concentration is relatively high, at least around 40%. The other components are emollients to facilitate gliding, and humectants like glycerin so that the cream does not dry and that it allows a better hydration of the hair and skin. These products generally have a pearly aspect which is obtained from a rather particular formulation technique. It consists in partially neutralizing the fatty acids present in the preparation in order to favour their recrystallization in the form of very fine structures generating a pearlescent effect. This effect develops gradually over time, which in the past led to these products being'matured' before being filled into the tubes. These were often metallic, but given the oxidation risks, they were gradually replaced by plastic tubes. Brushless shaving creams follow the same formulation logic, with a high soap concentration to soften the hair. However, a slightly higher concentration of emollients and humectants is required to allow an easy shave and compensate for the lack of badger effect.